Yes, it's true! Today's topic for the A to Z challenge isn't as obscure as the past two have been. Surprisingly, I racked my brain trying to think of a topic today before smacking myself upside the head. Scary really, since a life-sized Legolas shares my office with me. Legolas from Lord of the Rings. So, Elves are beings originally from Germanic mythology (basically Old Norse, Old English, and German). They're also featured in modern folklore (Scandinavian, German, English & Scottish, and don't forget Santa's helpers). In Norse mythology, they're divided between light elves (Ljósálfar) and dark elves (Dökkálfar). They have magical powers which they can use to help mankind or hurt it. Also, they're very connected with nature and tend to live in forests and away from people. Appearance-wise, elves are famous for their pointed ears and delicate beauty. Light elves tend to look like my friend Legolas up there with light hair, pale skin, and blue eyes. Dark elves, on the other hand, have black hair, dark eyes, and black skin. In terms of behavior, while dark elves tend to stay away from people and can be slightly hostile, light elves are willing to talk to people provided you're able to meet one. Having a dislike in iron (since it limits their powers), elves prefer the finer metals of silver or gold. Their normal working tools tend to be bronze. This is one of the reasons why elves utilize bows and arrows, as well as the obvious advantage of having their enemies at a distance. Elves have become a staple to the fantasy genre both in literature and gaming, helped by the success of the hugely popular roleplaying game Dungeons and Dragons. Some variations of elves depict them as very small-statured. This was especially prominent in Victorian literature. The way elves appear in the high fantasy genre and J.R.R. Tolkien's work (Lord of the Rings, etc.) comes from influence of 19th century Romanticism and its depiction of them being very beautiful beings. Santa's helpers "Christmas elves" became popular in the 1870s. It's your turn! Who are your favorite Elves? What books, movies, or games have you enjoyed with them in it? Thank you for this! I love mythology, especially elves and faeries and the like. This is really sad but I don't really know much about elves. I can't think of any that you haven't mentioned. I should read more books in the fantasy genre. I grew up with Grimm's Fairy Tales and Lang's Rainbow books of fairy tales, so my view of fairies and elves is--stay away from 'em! Danger! Danger, Will Robinson! I didn't like Legolas in the books, but the movie totally changed that for me. lol! Is the Hobbit an elf? Because I loved that book! Bilbo Baggins is my favorite fantasy creature ever, and fantasy is not my genre at all. I read Harry Potter but wasn't in love with it. I find it very difficult to get into fantasy. I invented my own mythical creature for my fantasy romance. It's so much fun. You've done a great job of describing the different kinds of elves. I used to read a lot of mythology. I love all this. Makes me want to read The Lord of the Rings. Tried to get started once but didn't get very far. I saw your comment on my post today. Thanks for coming by. This A to Z challenge is fun. I'm meeting a lot of new wonderful bloggers. That was fascinating. I had never known how intricate the description of fictional beings could be. Enjoyed reading your post. I definitely learned a lot from it. Thanks for stopping by my blog. I look forward to seeing what you'll have up tomorrow! Good luck! Excellent topic. I found it very interesting because I love elves and yet I didn't know about the iron dislike. hmmm... My elves are a little different though, I don't have the fair haired and skinned as the norm but they aren't all very dark either. I almost did Elves as my topic too until e-book insisted on being the topic. LOTR was my introduction to elves, and I have been a fan ever since! I've always enjoyed the elves in Patricia C. Wrede's Enchanted Forest Chronicles. They're persnickety. Wow! I'm shocked at how many comments I've gotten today. Thank you so much everyone! Laura, me too! I've always been a huge fan of mythology. Hart, thanks! I'm glad you enjoyed the post. Very cool about Dobby! KarenG, actually hobbits are their own race. Outside of Tolkien, they're known as Halflings because they are half the size of a human. I haven't read the Harry Potter series. I tend to read a lot of urban fantasy, but I enjoy high fantasy too. RosieC, you're welcome! I appreciate you stopping by. Donea, thanks! I'm really happy you're enjoying my theme. Oh yeah, I love me some Castiel! Ann, thank you! I really tried to go in depth without boring everyone to tears. lol! I love mythology too. I'm the same way with Lord of the Rings, I tried to read it years ago but couldn't get into it. I'm going to have to retry it too. You're welcome! I enjoyed your post. I'm having a lot of fun with the A to Z challenge too. Kris, I'm glad you enjoyed it! I love the way mythology is so detailed. Talei, great choice! Thanks for stopping by. Lynda, I agree! I think LoTR really elevated elves for me too. They're so fascinating. Amy, thank you! I'm really glad you enjoyed it! Dawn, thank you! That's one of the things I love when it comes to mythology, finding out tons of stuff I didn't know about the beings in question. I think your e-book topic was great! Damyanti, I'd known about elves before LoTR, but it definitely made me a fan of them! Alex, I'll have to check that out. Thanks for the comment! You had my attention at the word elf. Great post! Thanks, Murees! I'm glad you enjoyed it! I always enjoyed the Fraud depictions of elves. Erin, thanks for stopping by! 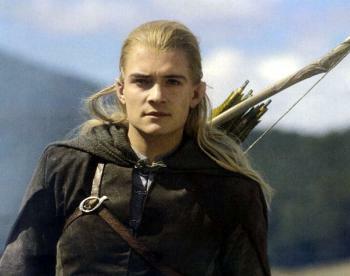 I really enjoy both him and Legolas. He was great in Pirates of the Caribbean too. Thanks for sharing about Froud! I'll have to check that out. Your blog (at least your current series which is all I've read so far...) is amazing! Thanks for writing it! Thanks for stopping by and commenting, Genevieve! I really appreciate it! I'm so glad you're enjoying the posts. I agree that Legolas has a special place in my heart too. I'm so glad to be away from the super heart-throbby stage too.